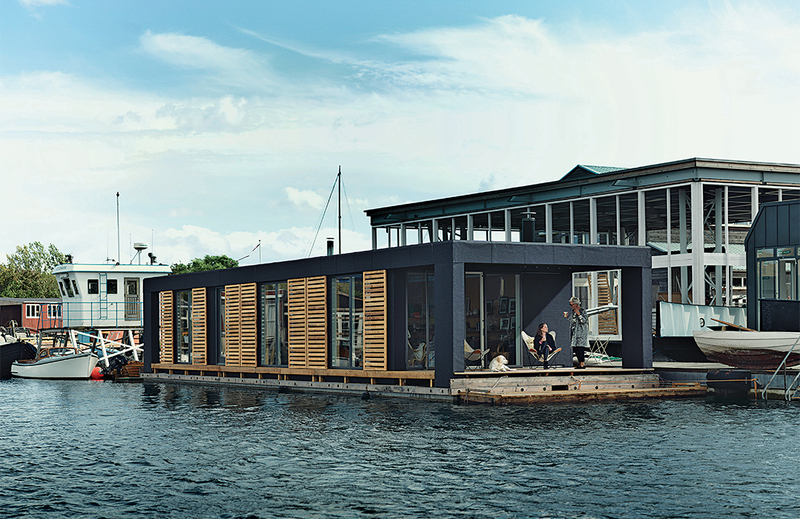 Lisbeth Juul and Laust Nørgaard drew upon their years of experience living on the water to design and build an 860-square-foot floating home in Copenhagen Harbour. The home’s minimal form and furnishings reflect the residents’ desire to downsize following three years on land. The narrow entrance hall faces another door, which opens seaward. Built-in cabinets serve as both storage and display. The porthole mirror is by Jacques Adnet. Outside, larch-wood shutters offer the residents privacy. Life for the couple centers on an open kitchen-dining-living area. Nautical references are kept to a minimum, but a few touches nod toward the home’s habitat. A Rais wood-burning stove recalls a ship’s furnace; soft green and blue fiberglass Eames chairs echo the color of the sea, which is a constant presence thanks to floor-to-ceiling glass doors. The custom dining table sits beneath a sculptural Titania pendant by Alberto Meda. Their yellow Labrador, Buster, rests next to a Hay sofa. The couple have crafted their own kitchens in the past. For their floating home, however, they selected the black Vipp kitchen, where Juul chats with her daughter, Karla. Glass doors grant the bedroom an immediate connection to the water. The sparsely decorated room features a PK33 stool, DUX bed, and framed photo of Björk by Anton Corbijin. In the bathroom, the home’s epoxy floor transitions from whitish gray to submarine yellow. The sink and tub are by Galassia, and the faucets are by Vola. A ladder, which serves as a towel rack, was sourced from the Danish Emergency Management Agency. The black-and-white industrial laundry bin is by Vipp. Bobbing amid midcentury houses on stilts, in a secluded part of Copenhagen Harbour, Lisbeth Juul and Laust Nørgaard’s compact floating home cuts a dramatically modern profile. The 860-square-foot home, which the residents designed and built themselves, is the culmination of 25 joy-filled years on houseboats, and three less-comfortable ones on land. In 2010, looking for a change of scenery, the couple and their daughter, who was born and raised on the city’s canals, disembarked from their houseboat and settled in an apartment in Copenhagen’s maritime Christianshavn neighborhood. “Our friends and family were quite surprised, but it felt right at the moment,” explains Juul. Soon, though, they longed to commune more directly with the open water. In September 2013, Juul and Nørgaard decided it was time to return to Copenhagen’s pristine waterways. Over the next eight months, they planned, designed, and built a home, on two concrete logs filled with lightweight polystyrene, moored near the artificial island Ved Slusen. The quiet location is worlds away from the bustling capital yet only 15 minutes from downtown by dinghy, or “sea moped,” as they call it. Juul, who works at a performing arts theater, appreciates their home’s proximity to the city’s creative pulse. There’s even an area adjacent to their dock to walk their yellow Labrador, Buster. For Juul and Nørgaard, a craftsman and seasoned shipbuilder with his own company and workshop, the most significant challenge wasn’t fabricating the floating home but downsizing their lives to fit into it. The pontoon they selected for the project is their smallest yet. “Our daughter, Karla, had moved, and we didn’t need so much space. We wanted to build and live more sustainably and maintenance-free,” Juul explains. Taking only their most cherished belongings with them, the pair bequeathed many of their furnishings to the new owners of their apartment. The result of this space-conscious approach is a floating home with a minimal interior to match its modest stature. Its symmetrical silhouette, larch-wood shutters, and black facade made of roofing felt hint at the simple, Scandinavian design that lies within. Five distinct spaces—a hall, bedroom, bathroom, kitchen-dining-living area, and terrace—are apportioned within the plywood-paneled interior. An industrial, black Vipp kitchen, located in the heart of the home, is the most immediately striking feature. Juul and Nørgaard chose this kitchen for the simplicity of its design and because it rests on slender legs rather than a monolithic base. Though it contains many of the home’s key functions, the common area is uncluttered. A set of Eames chairs, a Rais wood-burning stove, and a stainless-steel propeller blade (one of the few overtly nautical references) adorn the space, which opens onto a low terrace that glides just above the water. Two canvas Bat chairs, one for each resident, are oriented north, away from the sun’s harshest glare. A design priority for the residents was including avenues for aquatic light to enter the home. Their narrow entry hall is bookended by glass doors, permitting light to bisect the width of the house. “It’s like living in a summerhouse all year round. The light is absolutely the most life-giving thing about it,” says Juul. Opposite the front entrance, the couple’s bedroom opens seaward, affording waking access to the cleanest water in Copenhagen. Juul begins each day by diving in—just two feet from her bed. The couple doesn’t know whether they’ll remain in this home permanently, but returning to land seems unlikely. After nearly three cumulative decades on the water, a floating home is more a fact of life than a flight of whimsy. “It’s where our way of life is most fulfilled,” says Juul.